Today we celebrate the birthday of our nation's founding father George Washington. Angels played an important part in helping him to reach his destiny. 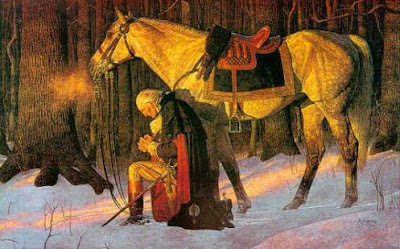 Although this painting was done of an older Washington praying at Valley Forge, I recall reading an account at an earlier time when it appeared that George Washington's angels took charge over him, protecting him from great harm. During the French and Indian War, the 23-year old Washington was assigned by his commanding General to take orders to the officers on the battlefield. In one battle, George's life hung in the balance for two hours. Indian sharpshooters caused 63 of the 86 officers to become casualties. After the battle, Washington reported that four bullets went through his coat!The Indians had shot two horses out from under him, but he escaped unharmed. Fifteen years later, the Indian Chief in charge of that battle met Washington. The Chief recounted: Since he saw a power mightier than we was shielding you, you were under special guardianship of the Great Spirit. He called for a cease fire on Washington, the man who is the particular favorite of Heaven and who can never die in battle. George Washington went on to fulfill his God given destiny as he first President of a new nation. God is no respecter of persons. The angels protect and guide us, too. They are God's messengers that intervene when needed so we can fulfill our life's purpose. May you feel the guiding hand of your angels leading you today. P.S. You may want to read The Bulletproof George Washington by David Barton.